As the results publish, the candidates who appeared in the examination will be able to check theirs on the official websites of the Bihar Board (BSEB). Like every year, numerous students appeared for the BSEB Matric exams. A large number of examination centers were booked to cope up with the increased number of appearing students. Since the day the exams have been finished, they are eagerly waiting for the results and hoping that they will be announced soon. Our team wishes students all the very best for their future. Below are some of the simplest instructions/steps which they can follow to check out the results. Scroll down and check it once. Look for the appropriate link and click on it. Now, it will ask you to enter some details. Enter them and click on submit button. The result will appear in the next screen. Save your result and take a printout. It may be of some use shortly. Helpline numbers of BSEB are 0612-2235161, 0612-2226926 and 0612-2225549. The fax number is 0612-2222575. Students can also receive their results by SMS (text message) on the mobile phone. For example BIH14ROLLCODE + ROLLNO and send it to 56263. 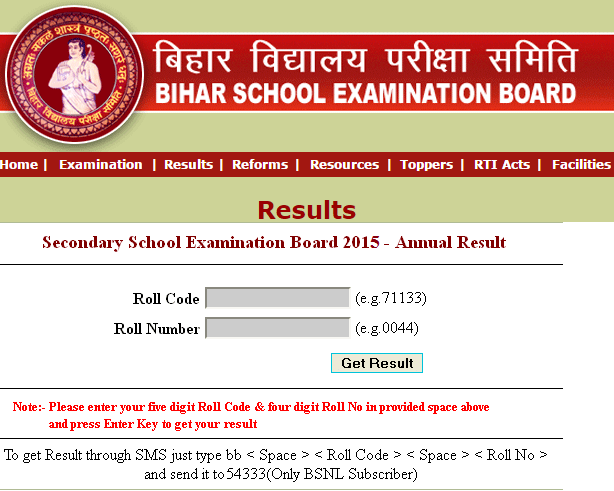 The Bihar School Examination Board (BSEB) was built to improve the education system in the state. Its responsibilities include conducting examinations at the end of every session, prescribing the course of studies for the various exams it holds, carrying out all the other activities for the benefit of students and education as stated in the rules and regulations of the board. Usually, the annual secondary school examination is conducted by BSEB in the month of February-March while it holds supplementary school exam (SSE) in the month of August-September as per the prescribed course. Along with the above-mentioned examinations, the other works of the board includes conducting the departmental examinations (they may not be yearly) for example diploma in physical education, certificate in physical education, and teachers training test (TTE). It does all the work as per the terms and conditions of the state government.